Facebook can be a powerful and affordable advertising channel when ad campaigns are created the right way. In this guide, we aim to help you plan the best possible Facebook ad campaign to achieve your marketing goals. If you’re not sure where to begin with your paid social strategy, a Facebook ad campaign could be a great place to start. Facebook ads can play a valuable role in your digital marketing strategy, if you use them to expand and engage with your audience the right way. Make sure you and your team are prepared (and on the same page) before investing in paid social efforts. Paid social should be used as a complement to your social media strategy, it shouldn’t be your sole strategy. 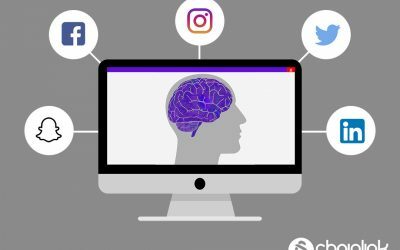 We’d like to preface this guide by saying that running ads on social media platforms (or paying to promote posts) is not always the right move. Are your leads active on social and how likely are they to convert? Paid social campaigns require you to define “conversion events” for selected campaigns. A conversion event could be defined as a purchase, a form submission, a link or button click, etc. Usually you need a minimum number of conversions on a consistent basis in order for an ad campaign to even make sense financially. For example, Facebook requires that at least 50 conversion events take place per week in order for Facebook’s ad optimization tools to work properly. Side Note: Check out this comparison infographic (pictured above) created by fellow marketing blogger, Andrew Hubbard. 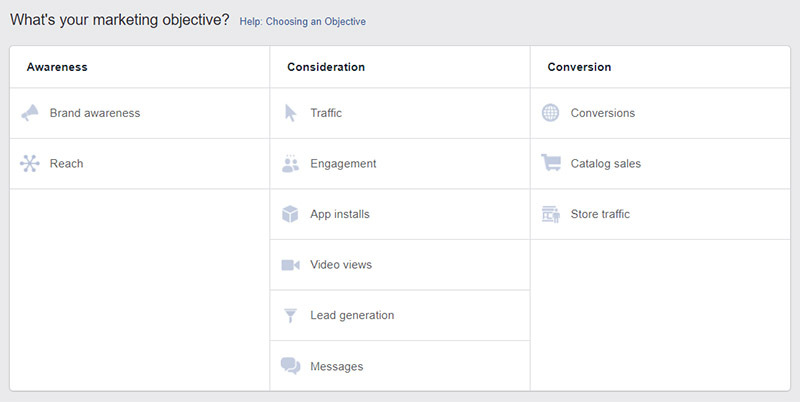 There are several different options for Facebook conversion tracking. 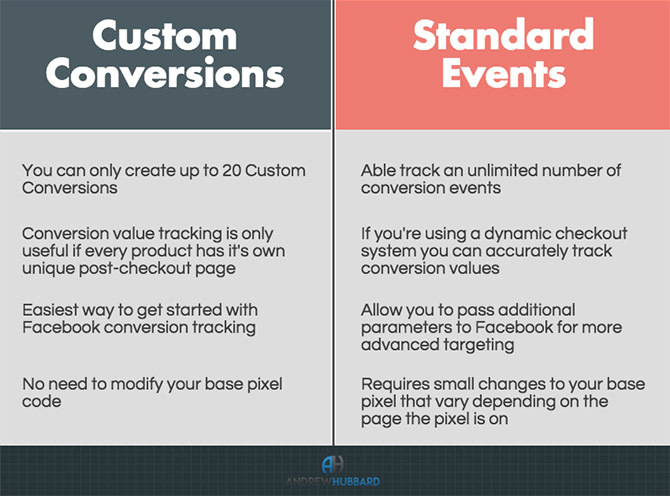 Whether you decide on standard conversion events or custom conversion events depends on the nature of your campaign and how comfortable you are learning different tracking features. How does your business niche affect the cost of social advertising? The cost of your paid social efforts are largely dependent upon your industry and niche. Depending on your type of business (and the time of year that is most important for your niche) you will face varying levels of competition, and therefore varying ad costs. Be sure you know how to set the appropriate goals for your ad campaign and budget accordingly. Are you able to achieve the same business objectives online without paid social? Ideally, the answer to this question should be yes. 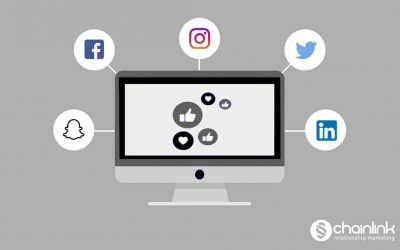 Social media advertising should make your business/marketing objectives easier to achieve, but your success should not be reliant on your ads. Also, don’t fall into the trap of being convinced that allocating part of the budget towards paid social is necessary simply because the competition is doing it. Or, some marketers will claim it’s the fastest way to increase online visibility. If you can’t justify it in terms of ROI and other quantifiable metrics, don’t rush into spending money on paid social. For example, Facebook’s format for choosing a campaign forces you to choose a marketing objective for that campaign. There’s a process to creating ads on social media platforms that actually work. Before you can even think about best practices and how to position your campaigns to get more clicks, you have to guarantee that you understand the basic needs of your campaign. 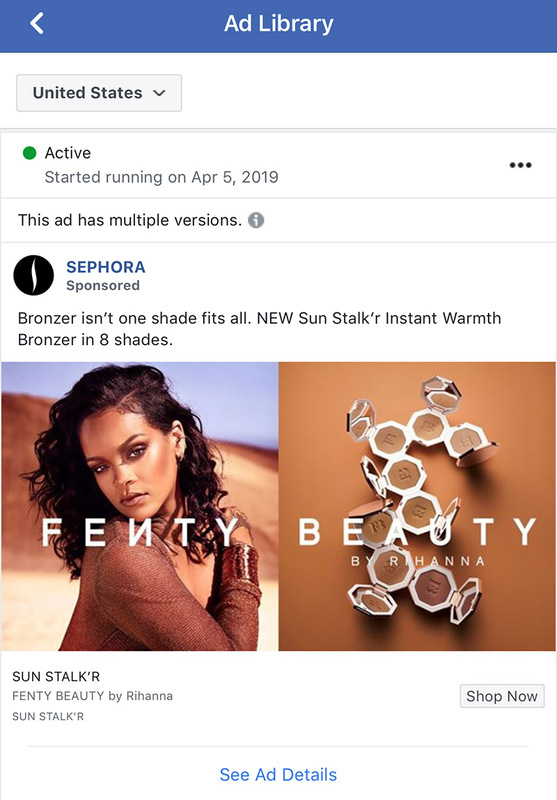 Take a look at this basic Facebook ad by the beauty retailer Sephora. Note how the reason for the ad is obvious: announcing new and exclusive products for the new season. Every element of the ad (the ad copy, image, caption and call to action) all serve the purpose of emphasizing the exclusivity and urgency of the promotion. If you’ve run campaigns through Google Ads, then you know how an ad’s Quality Score plays a key part in determining how much you have to bid and ultimately ad placement. In a similar way, social media platforms like Facebook have a “relevance score” that influences factors such as cost per click. The score ranges from 1 to 10. So, even though relevance score doesn’t directly determine ad placements or bid costs, the factors that make up the relevance score can. The digital marketing world is full of jargon and abbreviations, but social media advertising has its own unique terminology. Let’s focus on the terms specific to Facebook advertising. There is a lot of overlap between these terms and the terms used for Google Ads. When you launch a pay per click (PPC) advertising campaign on Facebook, you need to be aware of the CPC. 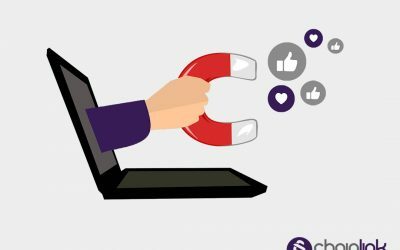 For campaigns focused on “Likes” as a main metric, advertisers can opt to be charged every time a user clicks the “Like” button on their Facebook ads. CPA is when the cost of an ad is determined per “action” that a user takes. 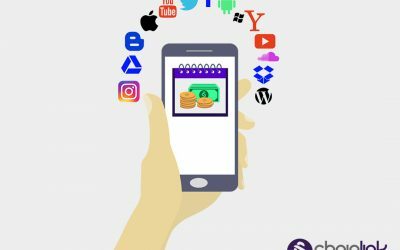 Advertisers can opt to be charged every time a user takes a specific action (such as clicking a button to install an app) if that makes the most sense for their campaigns. CPM is the cost per 1,000 impressions, and it’s important when measuring brand awareness. This metric is calculated by the total impressions divided by “reach”. Reach is defined as total unique users. It’s a useful number to help advertisers quantify how often an individual user sees an ad. If this number is super high, you probably want to readjust accordingly so you don’t bombard and annoy your audience. 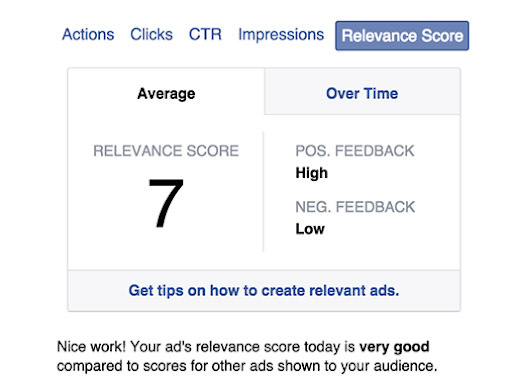 As mentioned previously, relevance score is determined on a scale of 1 to 10, and it’s based on audience response to your ad. It will only appear after your ad has received more than 500 impressions. Facebook supports business owners with a number of free courses and tools available when you register for Facebook for Business. The educational resources are great, and you could gain a solid understanding of how to run paid social campaigns by taking the lengthy courses on Facebook Blueprint. Instead of sifting through dozens of courses., keep reading for a comprehensive (and consolidated) introduction to running Facebook ads. Important Side Note: It’s crucial to make sure you have Facebook Pixel set up, which is basically a tracking tag (code snippet). Even if you don’t start running Facebook ads yet, it’s useful to start by installing the Facebook pixel on your website. With Facebook pixel, you’ll collect invaluable data that you can use for the future when you do decide to run the Facebook ad. Also, you can add a pixel to a specific ad or series of ads to track them. A successful Facebook ad campaign starts with shaping your efforts around targeting the right audience. Facebook divides ad audiences into three types. These types of audiences are determined in different ways, which we’ll explain below. Core audiences allow you to target ads using Facebook data. It’s the default option for Facebook ad targeting. 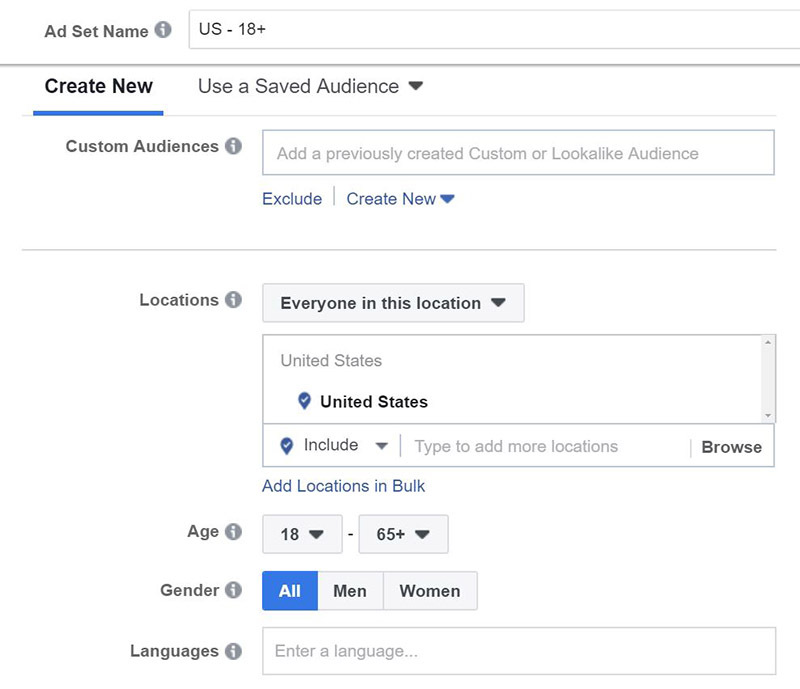 Custom audiences are created using data from your Content Management System (CMS), website, mobile app, or other sources to target your Facebook ads to people you already know. You can create audiences from your CRM or data warehouse, too. You have the option of using website or mobile app activity information to determine how to target your audience. Some advertisers opt to use the engagement levels of different segments of their target audience on Facebook as an indicator of who should see which ad and when. 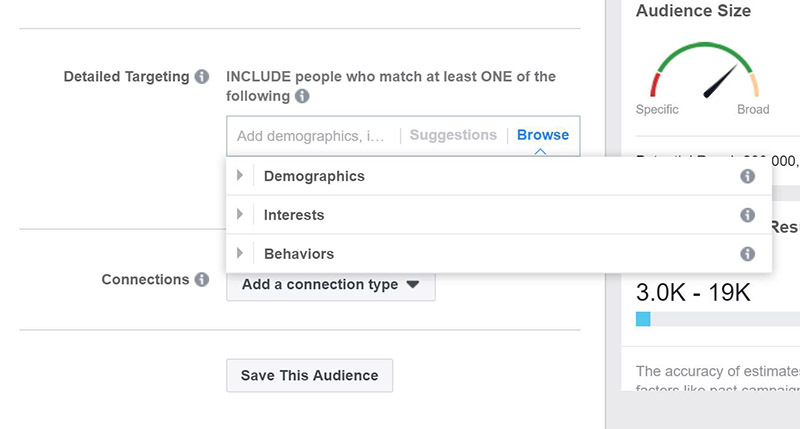 Facebook also offers detailed targeting options and connection targeting to hone in on prospective and current customers based on how they’re connected to your business. The term “lookalike audience” was coined by Facebook, and basically it means an audience you create based on how similar they are to audiences that you’re already successful targeting. What does that mean? In simplest terms, lookalike audiences can help you find and deliver ads to people who share demographics and behaviors with your current customers. How do you actually create them? Take a look at the people who like your Facebook page, conversion pixels, or any of your existing custom audiences. 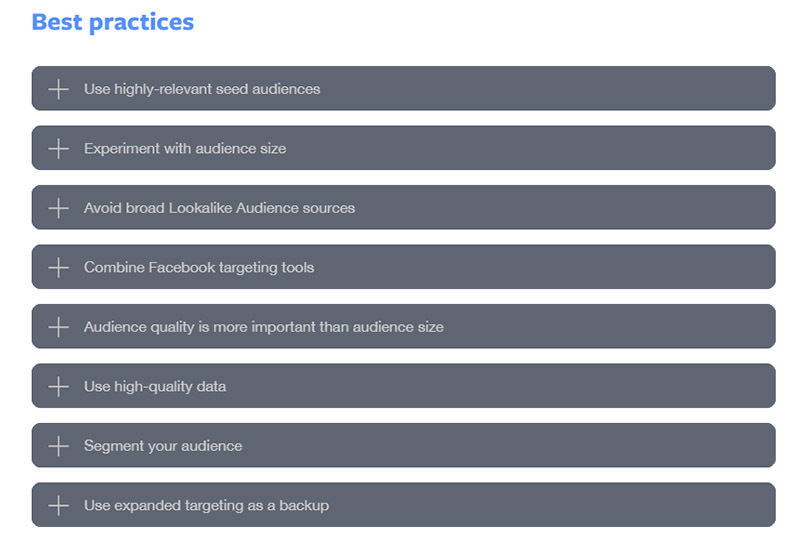 See below for some best practices recommended by Facebook when creating your Facebook Ads campaigns’ audiences. After specifying your target audience, it’s time to work with your creative team and choose the ad format(s) that will resonate with your audience best. Whether you’re focusing on the delivery of one ad, or you’re planning an entire ad set, the visual appeal of your ad is extremely important. It’s in your best interest to create several versions of your ads as you run your Facebook ads campaigns. That way, you can figure out which variations in visuals and copy improve your ads’ performance over time. We’re going to streamline some of the in-depth descriptions of different ad formats available (long explanations found in Facebook’s Help Center) and help you expedite your success with creating Facebook ads. 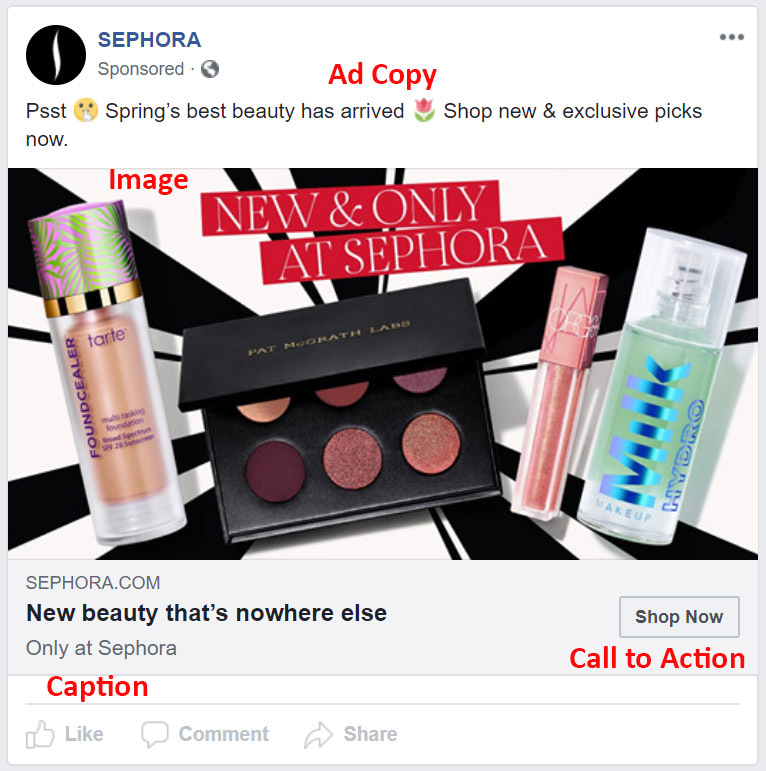 An image ad is the typical Facebook ad that has one image with clever copy and a solid call to action (CTA). The single image ad is versatile because it can be used across most placements. 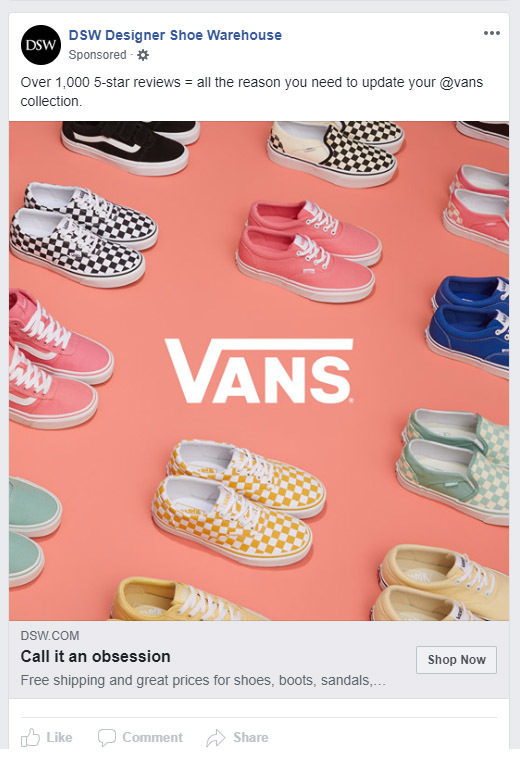 In this ad for DSW, it’s easy to see how the single vibrant photo and CTA could be enough to convince someone to click on an ad. Carousel ads are great because they allow you to show multiple images (or videos) at a time in one ad. People can swipe/click through each image or video within your ad, which comes in handy when you have multiple types of products. Slideshow ads have the same idea as carousel ads, displaying multiple images/videos at once. The difference is that instead of clicking the arrow to see the different images, the slideshow automatically plays once they scroll over the ad. Ideally, the series of images you choose will be related and tell a story. Some advertisers might opt for a slideshow ad as a cheaper alternative to a video ad. The production cost of a high quality video are astronomical compared to that of a slideshow. 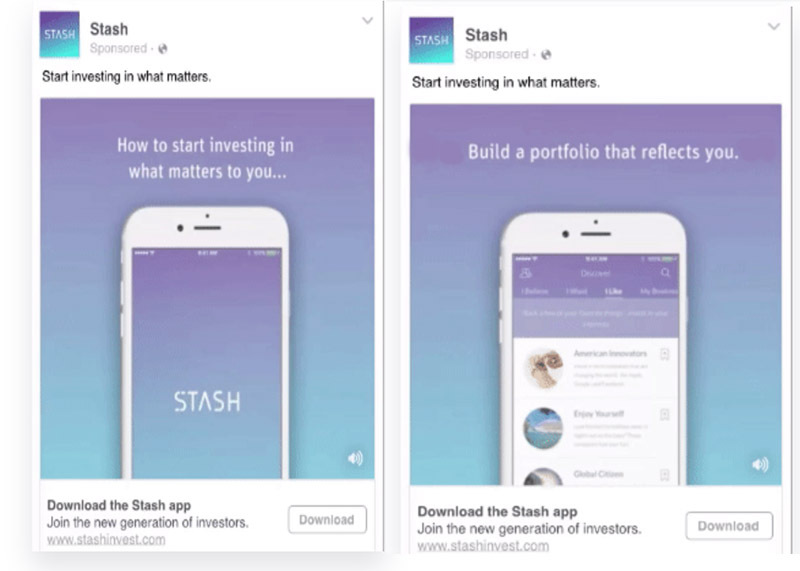 Check out the simple example of a slideshow ad for an investment app called Stash. The “slideshow” is really just two alternating images. When you want the most visually engaging way to grab your target audience’s attention, video ads are almost always the best choice for your Facebook promotions. 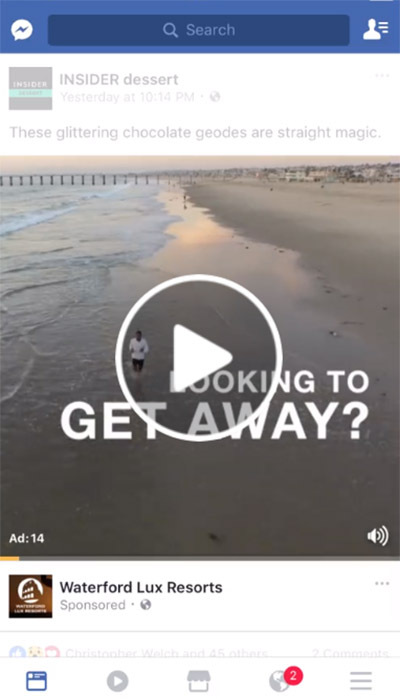 Facebook allows you to create video ads on your business’s Facebook page, or using one of the platform’s advertising tools (Ads Manager or Business Manager). Paying to promote video ad views and encourage conversions can have a rewarding outcome. An “instant experience” is exclusive to mobile devices. When someone interacts with your ad while using the Facebook app, a full screen view of your ad opens. This is a great idea if a large part of your product’s selling point is visual. You can design this ad experience however you prefer, with a photo carousel, a video, or even an interactive element such as a quiz. The instant experience ad can be disruptive, so be sure you make it appealing to your target audience. 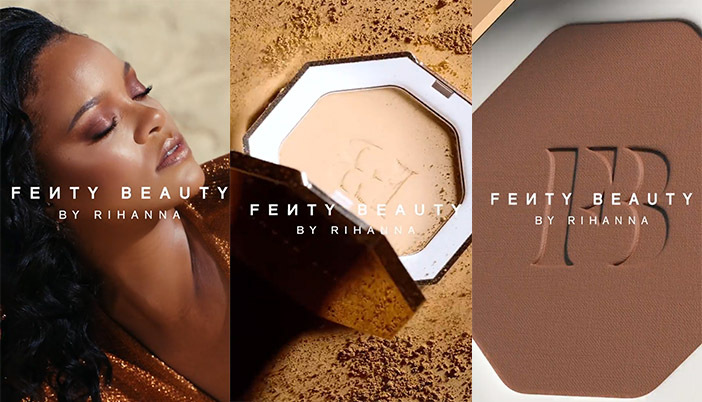 For example, Sephora’s Instant Experience ad for Fenty resonates well with their customer base, especially with the celebrity appeal of the product. See below how the ad would appear in someone’s mobile Facebook feed without seeming different from other ads. Then, when you click it you’re brought to the full screen “instant experience”. In this case, the experience is a brief but visually captivating video edit promoting the product. Note how the video is optimized for mobile by being shot vertically (three frames from the video are below). A “collection” ad is another type of mobile device exclusive ad format The format allows users to browse and buy products/services on their smartphones in an immersive way by simply tapping on your ad. 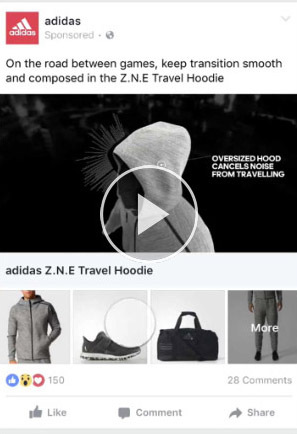 Without leaving the Facebook app, you can browse more products or learn more about the features of a specific product, as seen in the example from Adidas below. We’ve covered some of the major ad formats, but we haven’t talked about recommended practices for ad copy, headlines, descriptions, etc. Our best advice is to hire a team that understands how to capture people’s attention with catchy copy, high-quality imagery, and/or creative graphics and design. Also, remember that you can always go back and edit your ads (even ads in an active campaign) if something is not working. There are certain guidelines to follow to make sure the changes you make don’t negatively affect your campaign. Now that your ads are created and ready to show your audience, you have to consider where exactly they should be placed. What kind of ad placement would be most visible to your audience and most effective? Facebook allows two approaches to using placements: automatic and manual. Let’s go over some of the ad placement options Facebook offers. 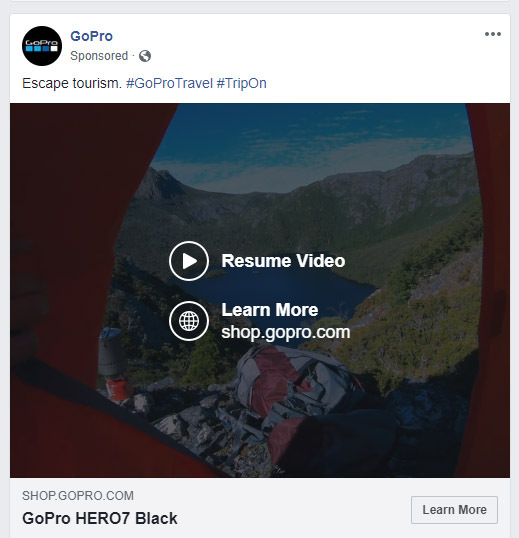 It’s common to see Facebook ads that appear in your news feed (on desktop and mobile) and look almost as natural as any other post on your feed (except for the important “Sponsored” distinction at the top of the post). 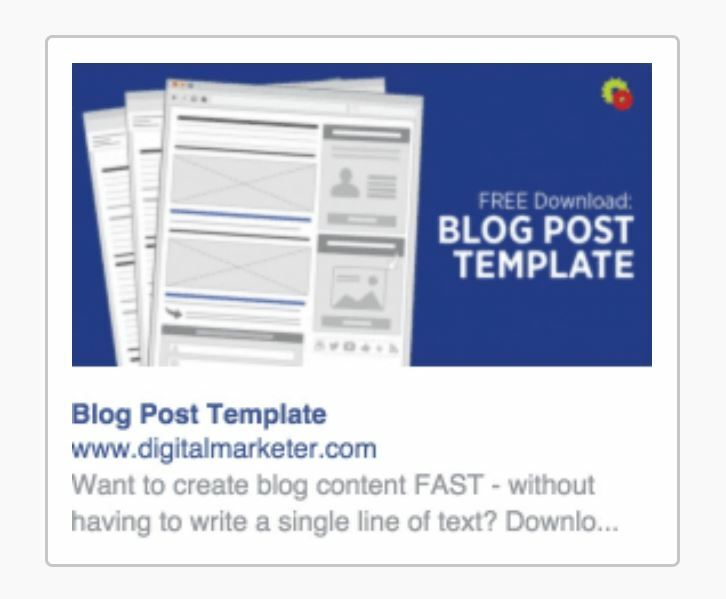 Facebook requires a standard ad format for ads that are intended for a user’s feed. The ad includes a headline, ad copy, image, video or both image and video, and some kind of call to action (CTA). When they click the CTA, users are brought to a landing page or other website page of the advertiser’s choice. Users comment, like , and share these ads as they would for any other Facebook post. 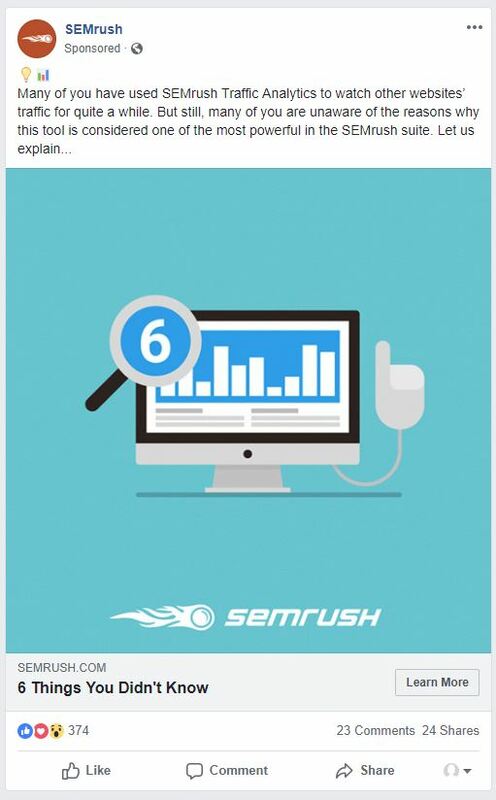 For example, as digital marketers who are frequently visiting various industry blogs, it makes sense why SEMrush would target us with news feed Facebook ads. Facebook ads placed in the right column of Facebook’s platform are typically more costly than other ad placement options. Facebook offers an option for mobile ad placement that’s geared towards content promotion: instant articles. The”instant articles” format is especially beneficial for publishers to promote fast-loading articles in a seemingly organic way using the “instant article” placement tool. Instant articles allow publishers to manually place ads (or opt for automatic placement) every few hundred words. Facebook also claims that readers are 70% less likely to abandon an article because it instantaneously loads. In-stream video ad placement can be a relatively risky tactic. The idea is that your video ad briefly interrupts whatever Facebook video your target is in the middle of watching. 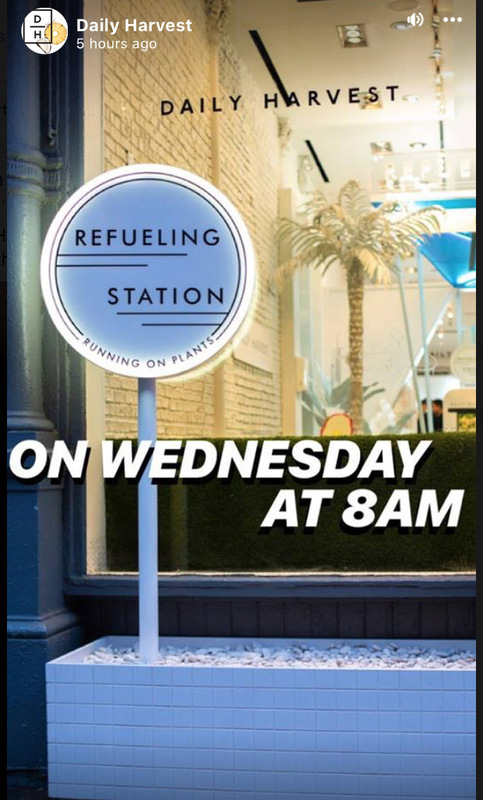 Even though it’s not a preferred tactic, in a similar way that pop-ups are unpopular but effective, placing video ads in-stream does capture people’s attention because they are already engaged. Before jumping into it, weigh the pros and cons and decide if this type of video ad placement makes sense for your business. Take a look at this example of one resort’s video ad interrupting a video by INSIDER dessert. Another common choice for video ad placement is at the end of videos related to your brand on Facebook. In this case, you are paying to place your video ad in the “suggested videos” section at the end of a relevant video. Make sure your video ad’s title and thumbnail image looks interesting to your target audience (without looking like clickbait). Otherwise, this ad placement choice could be a waste of money. 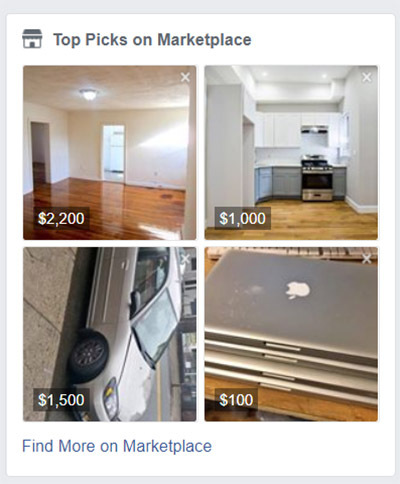 If you have ever visited Facebook Marketplace, you know that it’s a similar concept to Craigslist. People typically don’t just browse Facebook Marketplace without a specific purchase already in mind. 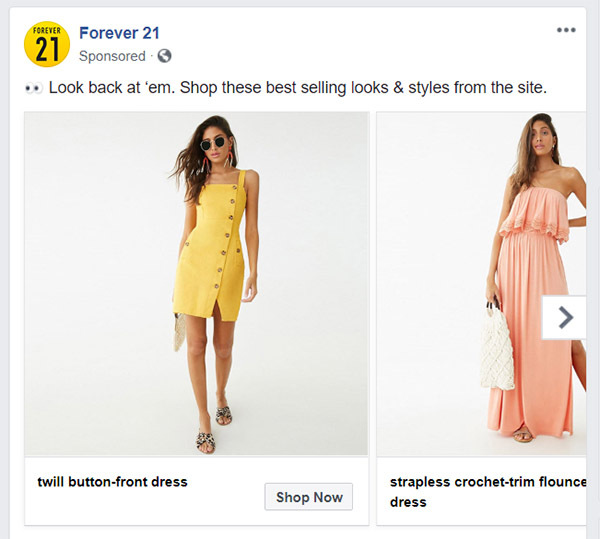 Strategically placing ads for your products within a part of Facebook where users are already primed to buy something could be super effective. However, Marketplace is only a few years old and the ability to advertise within Marketplace is even more recent, so you probably don’t want to invest too much until you test it out fully. If you intend to place your ad in between Facebook Stories, take note that your ad will have to be mobile optimized and follow specific guidelines. It will have to be less than 15 seconds and be visually appealing in a vertical full screen format. Thanks to the brevity and visual appeal of this type of ad, it usually performs well for brand awareness purposes. The difference is that Daily Harvest is paying to show you their Facebook story in between the other Stories you’re watching at the time. Note: There are options to advertise within Facebook Messenger as well (but this is probably only a good idea in specific cases). Sponsored messages like this have a tendency to seem annoying and/or invasive. Now that we’ve covered some of the most frequently chosen options that Facebook Ads offers, how do you know what’s best for your business? Almost all of these placement options are enabled when you first start your ad campaign. The options that you decide to disable will depend on your goals for a specific campaign. The last section helped realize what it takes to create a paid social campaign on Facebook. Now, let’s avoid some common errors made by online advertisers so you can optimize every Facebook ad campaign. Now that there is a searchable transparency library for all ads, it’s more important than ever before to keep an open dialogue with your audience about your approach to ads. Anyone can search to see how many ads you’re running at the same time. Although the main reason behind the creation of the transparency library was to hold organizations and governments accountable, it can be used for multiple different reasons. It’s much easier for watchdogs to find and flag ads on social media that they find problematic. The best thing a brand can do is be aware, prepared, and respectful when dealing with feedback from your ad campaigns. As we mentioned earlier, online advertising (on and off social media platforms) is basically a series of auctions. A bid strategy is essentially an ad cost control tool. Your strategy will allow you to control your cost per optimization event the same way your ad budget controls your overall ad spend. Being too conservative with your bids can hurt you. Setting too low of a limit on bids or a bid cap can lower performance of your ads (some audiences are just more valuable than others). In other words, even if your bid cap is higher than intended and you burn through your daily budget (or lifetime budget) faster than intended, you’ll still see more conversions and your delivery will be stable. Pay attention to how often your target audience is seeing your ads. Even an audience that is a perfect fit can experience “ad fatigue” if your ads are displayed to them too repetitively. Thankfully there’s an easy fix to avoid this. You can set frequency caps to limit the number of times people see your ads within a time frame. Another step you can take to avoid delivering your ads too frequently is to set rules in Facebook Ads Manager. You can create a frequency limit condition under “Rules” that automatically turns a campaign on or off as needed. 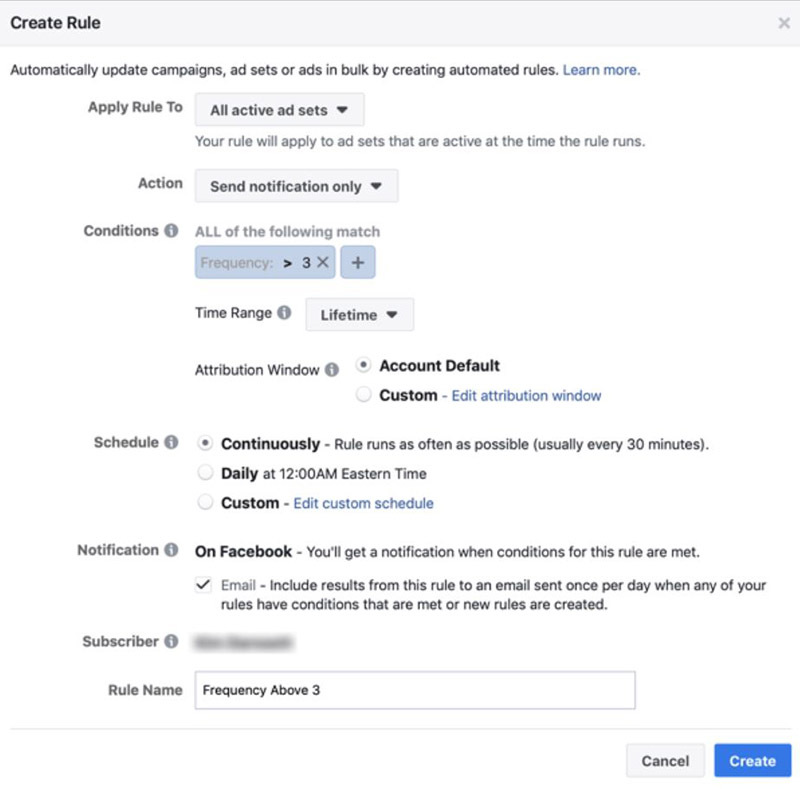 You also have the option to create rules to be notified via email of ad frequency so you can be proactive about when you need to adjust accordingly. Important Side Note: Avoid becoming a nuisance to people who support your business by turning off ads for people who already bought the specific product/service that you’re advertising. It’s as simple as remembering to turn off those people’s profiles as audience members so that they don’t continue to see your Facebook ads. Set reminders, find an automated shortcut, or do whatever works best for your team to accomplish this task which makes a huge difference to customers. Budgets for social media advertising can disappear quickly if the funds are not distributed properly. To make the most of your paid social budget, ideally you would split it equally across several ads or sets of ads within a single campaign. But what happens when one set of ads isn’t performing as well as others within a campaign? Are you still supposed to spend the same amount on those underperforming ads? Clearly, no. Thankfully, Facebook offers a Campaign Budget Optimization tool. Depending on an ad campaign’s performance, the tool will focus funds on high-performing ad sets when needed. This means your money goes directly where it should to the ad sets that are giving you results. There are few things you have to do to set this up. Be sure you’re following best practices before you select Budget Optimization found under Campaign Details. 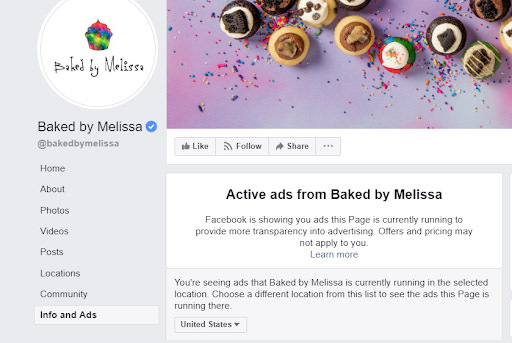 There is no one-size-fits-all Facebook ad campaign strategy out there, especially given how granular and diverse the platform’s ad options can be. Many business owners don’t have the time or money to invest in taking Facebook’s advertising exams to receive their Facebook Blueprint Certification. Plus, it can be overwhelming to navigate the enormous amount of free educational resources out there on your own. At Chainlink, we want digital advertising to be easy and consistently effective for everyone. We are our clients’ best advocates every step of the way. Our team wants our clients to be empowered by their knowledge of marketing best practices, and confident in their strategic decisions. We believe in our results-driven and technology-first approach. It has helped our clients succeed with their paid social campaigns and so much more. Want to learn more about how our team can help you manage your digital marketing and advertising projects? We’d love to tell you more about how we can make your life easier and guide you to reach your goals. Drop us a line and we’ll talk soon! Don’t forget to sign up for our newsletter, too.